EU regulators (the European Commission) are putting in place a new set of regulations (in the works for some time now) on sovereign CDS. The goal is to prohibit "naked shorting", requiring that all CDS purchases be "covered". These types of proposals have been circulating in the US for a few years as well. Basically as long as the buyer can identify any exposure in a specific country that is deemed "correlated" to sovereign debt, CDS buying is permitted. "Correlated" is loosely defined and is required to meet some quantitative or qualitative criteria. CDS size has to be "proportional" to the exposure size. CDS market makers are exempt if the protection they hold is part of "market making activities". Just as an analogy to the equities markets, this rule is the equivalent of requiting that investors can only buy put options if they hold the underlying stock, while short selling of put options would be permitted. And shorting the stock directly is also permitted. Most equity investors would find such rules rather bizarre. It's not clear what if anything the regulators will be able to accomplish with these rules. If they wish to reduce the shocks to sovereign debt prices, they only need to look at CDS volumes. CDS net notional is a tiny fraction of all the sovereign debt. 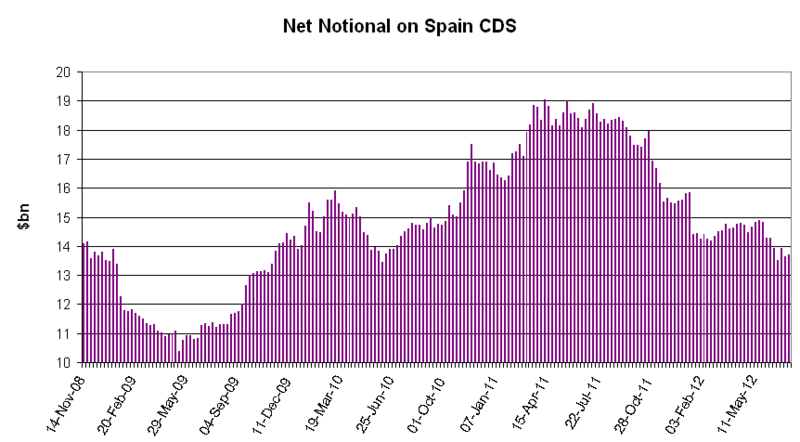 CDS on Spain for example is less than €14bn vs. hundreds of billions of Spanish debt outstanding. The widening of Spanish spreads to record levels recently had nothing to do with CDS and everything to do with the risk that Spain may be unable or unwilling to meet its obligations. And the CDS widening was simply the "canary in a coal mine". Investors who want to short sovereign debt will end up doing it through reverse repo (shorting actual sovereign bonds) or simply moving the CDS transactions offshore. A hedge fund for example would be able to buy protection on Italy in an Asian jurisdiction to circumvent these rules. There are so many ways the sovereign CDS market could be improved (for example changing the ISDA committee process). Unfortunately this set of rules will not be one of those improvements. Most analysts expect this rule to have very little impact on sovereign CDS or bond spreads or even investor behavior. Instead it will introduce tremendous bureaucracy, allowing EU regulators to hire armies of people to monitor compliance.